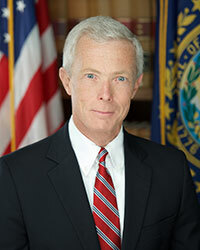 Concord NH – Attorney General Gordon J. MacDonald announces that Mark Burch, age 32, of Claremont, New Hampshire pleaded guilty and was sentenced today in the Sullivan County Superior Court on one class A misdemeanor charge of unsworn falsification. Pursuant to a fully negotiated plea agreement, Mr. Burch was sentenced on the unsworn falsification charge to 12 months at the House of Corrections, all of which is suspended for a period of two years. The sentence also requires Mr. Burch to perform 100 hours of community service, with proof of the community service to be provided to the State within six months of today’s date, and to be of good behavior. The sentencing order also states that Mr. Burch will not seek employment in law enforcement in the State of New Hampshire. On March 28, 2018, Attorney General MacDonald announced that he had initiated an investigation into the conduct of then Sergeant Ian Kibbe and Officer Mark Burch of the Claremont Police Department. That investigation was initiated based on information from Claremont Police Chief Mark Chase, which alleged that while acting in their capacity as police officers, Mr. Kibbe and Mr. Burch had falsified documentation related to a search that occurred in late February, 2018. As a result of that investigation, charges were brought against Mr. Kibbe which resolved by way of guilty pleas to one class A misdemeanor charge of unsworn falsification and one class A misdemeanor charge of obstructing government administration. On January 7, 2019, Mr. Kibbe was sentenced on the unsworn falsification charge to 12 months at the House of Corrections, with all but 90 days suspended for a period of two years upon Mr. Kibbe’s release from incarceration. On the charge of obstructing government administration, Mr. Kibbe was sentenced to 12 months at the House of Corrections all of which was suspended for a period of two years upon his release from incarceration, to be served consecutive to the first sentence, if imposed. The sentences also require Mr. Kibbe be of good behavior and included the provision that Mr. Kibbe will not to seek employment in law enforcement in the State of New Hampshire. With Mr. Burch’s plea today, this matter is now concluded.